Reposition text boxes accurately in PowerPoint 2011 for Mac. In PowerPoint, you can always select a text box and move it around by dragging it with your mouse, and then placing it in a new position. But this process is just visual and not accurate enough. Yes, there is a way to accurately position any text box just where you want it to be located if you use guides. Having said that, do not move your text boxes until they contain all the text content you need within them -- or, you may find that your text boxes resize themselves when you add text to them! Of course, you can control this default behavior using the options explained in our Text Autofit Options tutorial. Although this tutorial shows you how to reposition a text box (or, also a shape), it can be used to reposition the text placeholders too, preferably in the Slide Master. Note: Typically text placeholders for regular text content or even slide titles are located in the same position on successive slides -- so, if you really need to move a text placeholder, do it within the Slide Master so that this change of position happens on all slides, providing a consistent look to your presentation. This will also prevent you from repeatedly moving the placeholders on each and every slide on your presentation. Want to know more about the difference between a text box and a text placeholder? Look at our Text Boxes vs. Text Placeholders tutorial. Open any slide that contains a text box (or a text container) -- carefully select the entire text container (not just some part of text in it) so that it shows a solid line with selection handles on its perimeter. In Figure 1 you can see a text box selected. Now, right-click to get the contextual menu as you can see in Figure 2 -- select the Format Shape option (refer to Figure 2 again). Alternatively, you can also choose the Format | Shape menu option as shown in Figure 3. Either of these ways will bring up the Format Shape dialog box. Make sure to choose Position option within the sidebar of this dialog box (see Figure 4). The Horizontal and Vertical options within Format Shape dialog box (highlighted in red within Figure 4), let you alter the corresponding horizontal and vertical positions of the selected text box. Horizontal: Type in a numeric value or use the increase / decrease buttons to change the horizontal positioning of a text box. 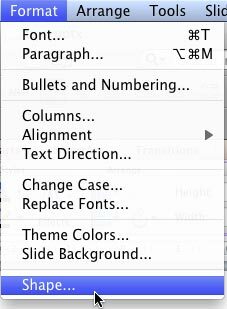 Vertical: Type in a numeric value or use the increase / decrease buttons to change the vertical positioning of a text box. The zero point for a text box is always calculated from either of two anchor points within the slide, as shown in the drop-down list for both the From options (highlighted in blue within Figure 4, above). Each of these drop-down lists have two similar options, as shown in Figure 5. If you make no choices, then by default all values are calculated from the Top Left Corner of the slide but you can also choose to position from the Center of the slide, which you can see in Figure 5 as the second option. Change the horizontal and vertical position values of the text box as required. Figure 6 shows the new values we used. You will see the text box in the new position as soon as you enter the new values within the Format Shape dialog box -- you may have to move the dialog box a little if it is hiding the selected text box. When done with repositioning, click the OK button to get back to the slide. Based on the values you have entered, the selected text box will be moved to a new place in the slide area. In Figure 7 you can see the selected text box repositioned (compare Figures 1 and 7). Make sure to save your presentation often.